Our kayak glided just above the calm water as we made our way in for the day. We were about to cross the channel, and I noticed a bigger object peeking out of the mangroves. My kayak partner and I paddled over and as we approached, I reached out to grab one last piece of “garbage” to load in the kayak and bring in with us. To my surprise, I flipped over the square piece of wood to find a picture frame—one of those vintage ones with beautiful character around the sides. This is when I stopped using the term “garbage” when referring to the mangrove debris. Nothing we picked up that day was garbage, or at least it wasn’t supposed to be. A lot of these items we were picking out of the mangroves came from a person’s home. This frame most likely once held a family photo or a portrait of a loved one. When looking at the aftermath of something as disastrous as a hurricane, it seems like an overwhelming situation. We often think how could we possibly make any type of difference or where do we even start to lend a hand? However, the recent Tourism Cares for South Florida program was a reminder that everyone can play a hand in making a difference, big or small. When individuals come together to each help just a little bit, the difference can be huge. 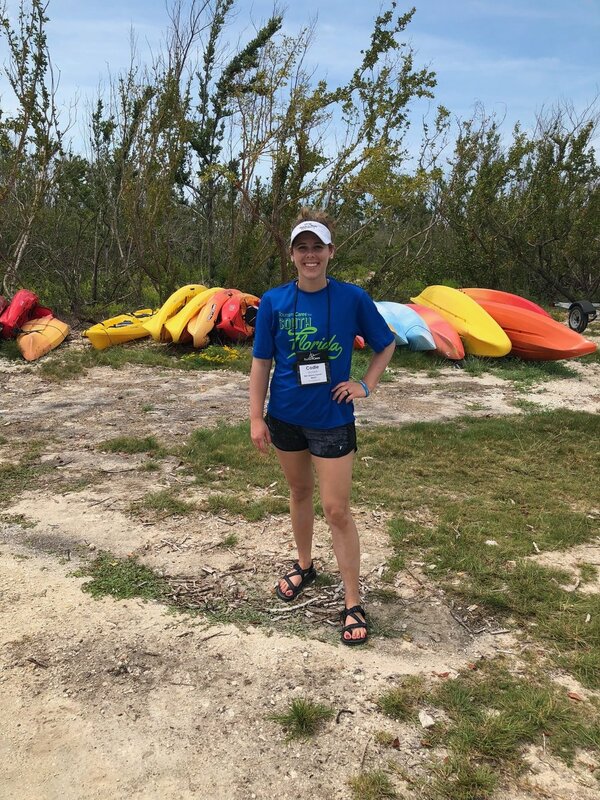 For example, about 40 out of the 150+ Tourism Cares volunteers worked in kayaks and on the shores cleaning up debris in No Name Key, each person bringing in a few trips full of debris picked out of the mangroves. A little bit here and there ended up being 20,960 pounds. In other words, this small group of people who gave a few hours of their time made a huge impact on an area in need. The mangroves now have a little more relief, and the coral reef is one step closer to safety. From cleaning and rebuilding to snorkeling and planting, each person who was involved in the Tourism Cares for South Florida program aided in accomplishing four months’ worth of work in one day. To see the various roles of people in the travel industry come together and share the same role for a day was inspiring. Whether it’s a dedicated volunteer trip or simply being proactive and picking up a loose piece of trash you see on the side of the walkway, it will assist in making the world a better place. Until you put yourself in the shoes of those who returned to damage homes and a declining eco-system, it’s hard to understand the catastrophe that hit this specific area. There is still lots to be done, and organizations such as the Conch Republic Marine Army are continually looking for volunteers who’d like to make a difference. One baby step at a time will soon lead to the finish line, and I was glad to be a part of one of these steps towards recovery for the Florida Keys.